More from the Thames Festival. You'll get a few more glimpses of this festival while I am feeling sorry for myself with my cold and not inspired to be out taking new pictures. They're loads of fun though. 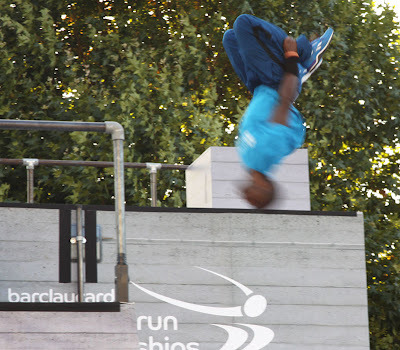 This is a free runner in action. They are amazing. Urban acrobatics. No safety nets and pausing for applause, as in the circus. These guys are in it for the fun and maybe a title at the championships. They are amazing aren't they? There is a milder form conducted in officers' messes called 'Mess Mountaineering' - it has led to broken limbs as well as broken equipment so perhaps not so very mild, though it is usually fuelled by alcohol . . . you know, no sense, no feeling! I'm having a problem with a cold too. WOW! This is an amazing shot! You caught him with his head down. That's fantastic! Cool shot! Hope you get better soon. Wow. Wonder how many times he fell on his head before he perfected that. You asked if this meant the end of summer. No, actually, September and October are two of our hottest months! July and August, with all the fog, are generally cool, to the point of 19th century American writer Mark Twain quipping that the "coldest winter (I) ever spent was July in San Francisco!" I can't climb stairs without feeling dizzy! thses lads are either brave or crazy but fascinating to watch. Great pics as usual, thanks. Hope you are feeling better now. they are either very brave or completely nuts!! !